The first line of Adventures of Huckleberry Finn (Mark Twain, 1884) hooked me the first time I read it as a child. It was one of my earliest reads of novel length, and I remained hooked throughout the entire story. 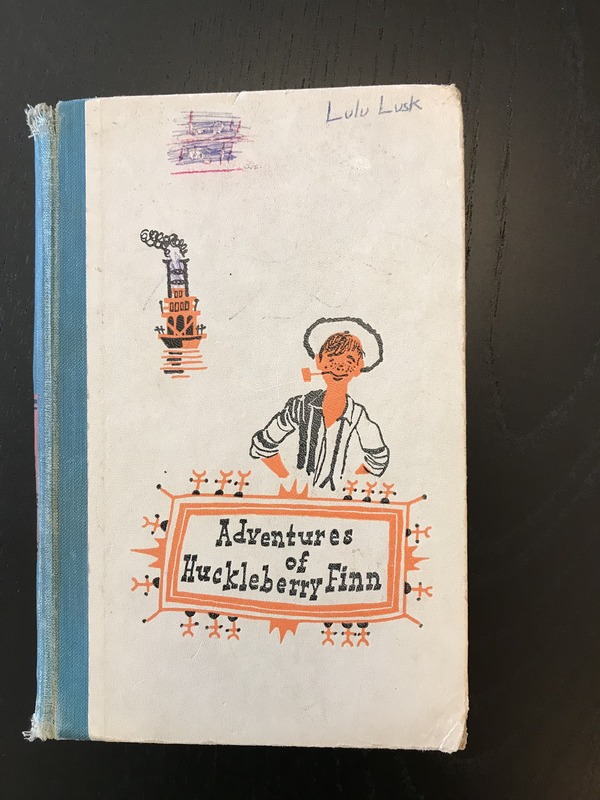 I so enjoyed the adventure that it became my first read at the end of every elementary school year. It was a celebration, a way to begin summer vacation. I never tired of it. Each year I was older, the story grew. It was new, yet an old familiar friend. I still have the very same copy of that well used book in my library today. My, did I want Huck to “light out” and not get caught. I don’t remember how old I was when the full force of Twain’s humor came to me as I read the story and these final words—a punch line of sorts. Dénouement, ketsu, kyū, end, resolution, conclusion, the bit just before the words FIN, FINE, or THE END—whatever you call the end of a story, the last line or lines, the epilogue, the final camera shot each has the power to deliver the full heart and soul of a story. A story you’ll never forget. Maybe you’ll forget some details, sure, but the way the story made you feel? You’ll never forget. The last line or camera shot will stay with you. They inspire a grin or a nod or tears or a “Wow” of admiration as they sum it all up, bring you back to the heart of the story. They may leave you with a feeling of a new story about to begin, or even with an important question or sense of wonder. On the re-read or re-watch, they contribute to your enjoyment of re-discovery. They wait for you. Your anticipation becomes part of the experience and sometimes, when they arrive, you can’t help but read them aloud or speak the line or lines along with the actor or narrator. Sometimes it is the last line we remember best. Here at the story’s end, Prospero has set Alonso, Antonio, Sebastian, Gonzalo, and Ariel free. He relinquishes his powers and asks not only for his own freedom, he asks also for forgiveness. This line never ceases to grab me as reaching far beyond Shakespeare, far beyond a wonderful magical tale. It speaks to me of finding human kindness and a plea for human kindness in return. So in America when the sun goes down and I sit on the old broken-down river pier watching the long, long skies over New Jersey and sense all that raw land that rolls in one unbelievable huge bulge over to the West Coast, and all that road going, all the people dreaming in the immensity of it, and in Iowa I know by now the children must be crying in the land where they let the children cry, and tonight the stars will be out, and don’t you know that God is Pooh Bear? the evening star must be drooping and shedding her sparkler dims on the prairie, which is just before the coming of complete night that blesses the earth, darkens all rivers, cups the peaks and folds the final shore in, and nobody, nobody knows what’s going to happen to anybody besides the forlorn rags of growing old, I think of Dean Moriarty, I even think of Old Dean Moriarty the father we never found, I think of Dean Moriarty. It grips me as geographer, writer, reader. It is a perfect close to a book that moves. It moves from your first introduction to Dean Moriarty, “tremendously excited with life.” Its movement is wonderfully relentless. Even years later, reading only these last lines I think “Wow…” I pause, I nod, I smile. I feel more like I’m reacting to a painting than words in a novel. He didn’t hear the gun when Guy shot him because he was dead. Yes, they will trample me underfoot, the numbers marching one two three, four hundred million five hundred six, reducing me to specks of voiceless dust, just as, in all good time, they will trample my son who is not my son, and his son who will not be his, and his who will not be his, until the thousand and first generation, until a thousand and one midnights have bestowed their terrible gifts and a thousand and one children have died, because it is the privilege and the curse of midnight’s children to be both masters and victims of their times, to forsake privacy and be sucked into the annihilating whirlpool of the multitudes, and to be unable to live or die in peace. Because of the spirit, I say. Because of the heart. Writing and reading decrease our sense of isolation. They deepen and widen and expand our sense of life: they feed the soul. When writers make us shake our heads with the exactness of their prose and their truths, and even make us laugh about ourselves or life, our buoyancy is restored. We are given a shot at dancing with, or at least clapping along with, the absurdity of life, instead of being squashed by it over and over again. It’s like singing on a boat during a terrible storm at sea. You can’t stop the raging storm, but singing can change the hearts and spirits of the people who are together on that ship. Ike Sallas was asleep when it began, in a red aluminum Galaxxy [sic], not all that far away and only a short skip into the future. The crows circled, cheering hoarsely. Mejack, the youngest, took the opportunity to swoop down and pick up a six-pack of Soggy rodents, to celebrate the victory. Rising above it, slowly and in silence, they saw that all its parts were of one piece, a painting of risen gold and animate clouds the long plumes of which climbed gently upward, billowing to heaven. The fine bays and rivers that surrounded the city had been moved to come alight, and for a hundred miles the bays the rivers and the sea itself were a pale shimmering gold. Now there are no more lakes in the clouds. The city is deep within its new dream. What of Peter Lake, you may ask? Was the past fully re-opened to him? Was he able to stop time? Did he rejoin the woman that he loved? Or was the price of the totally just city his irrevocable fall? At least until there are new lakes in the clouds that open upon living cities as yet unknown, and perhaps forever, that is a question which you must answer within your own heart. I have forgiven Earl Rogers’ daughter Nora at last. For as I’ve written it all out, here, I’ve seen that we cannot go back from where we are, and think what we would have done then if we had known what we have learned since, or blame ourselves because we didn’t. The little girl he hung on his watch chain as a kind of charm, the girl who was too little, I know now did the best she could, the tall young girl with her pigtails pinned up who said that No, Papa on the witness stand, seems to me another incarnation. I have forgiven her because every page and word I have written has shown me one thing about her. Right or wrong, she loved much. That is the greatest gift life can bestow on anybody. Sometimes, in the long summer evenings, the friends would take a stroll together in the Wild Wood, now tamed so far as they were concerned; and it was pleasing to see how respectfully they were greeted by the inhabitants; mother-weasels would bring their young ones to the mouths of their holes, and say, pointing. “Look! There goes the great Mr Toad! And that’s the Water Rat, a terrible fighter. And yonder comes the famous Mr Mole, of whom you’ve heard your father tell!” But when their infants were fractious and quite beyond control, they would quiet them by telling how, if they didn’t hush, the terrible grey Badger would up and get them. This was a base libel on Badger, who, though he cared little about Society, was rather fond of children; but it never failed to have its full effect. 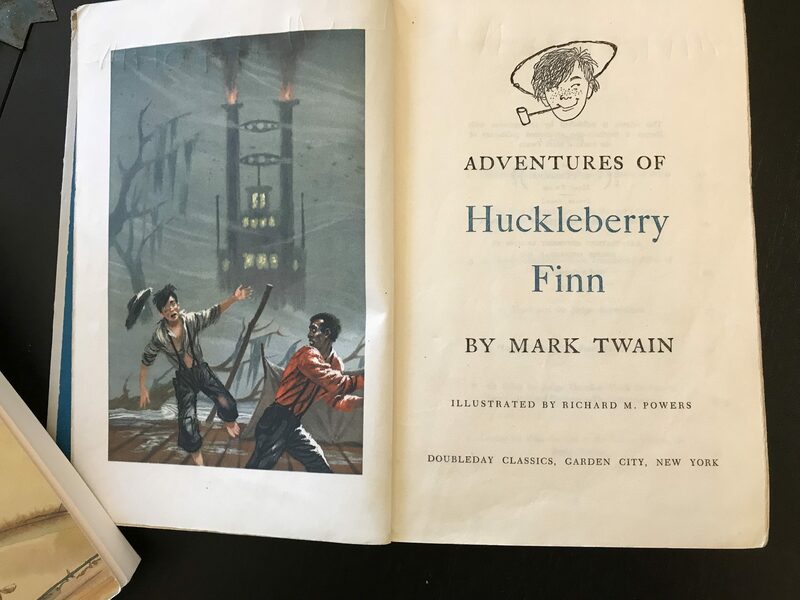 It has been awhile now since I’ve read Adventures of Huckleberry Finn. Summer is still a few months away, I just may line this up as my first read of the summer this year.